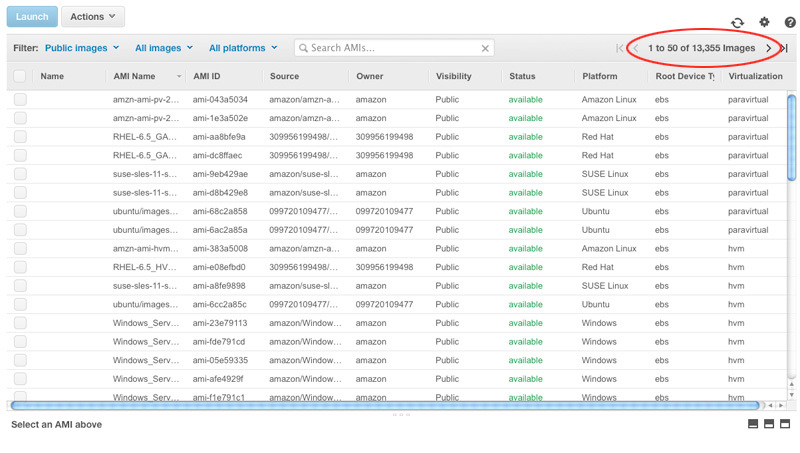 Here is a brief look at what the Amazon AWS system looks like for the end user. 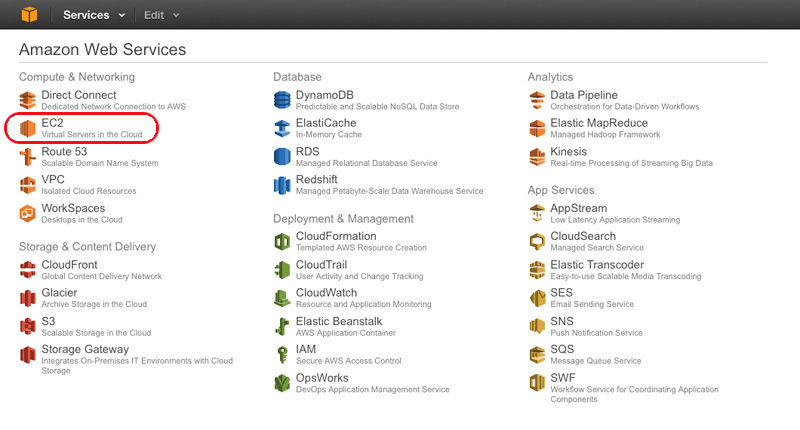 The landing page, or AWS Console, presents all the various offerings in one place. For the purposes of our comparison with an Open Stack system, we’ll be looking at EC2. EC2, the Amazon Elastic Compute Cloud, has a lot of similarities with the Open Stack system we have already explored. 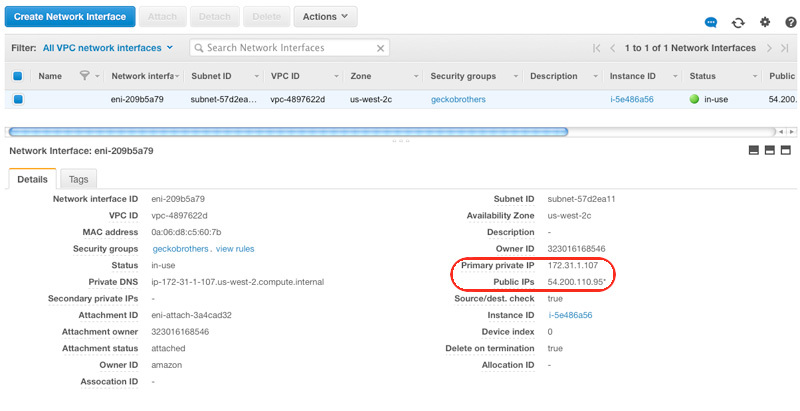 New machines, for example, are also referred to as instances under EC2, and you launch new instances. 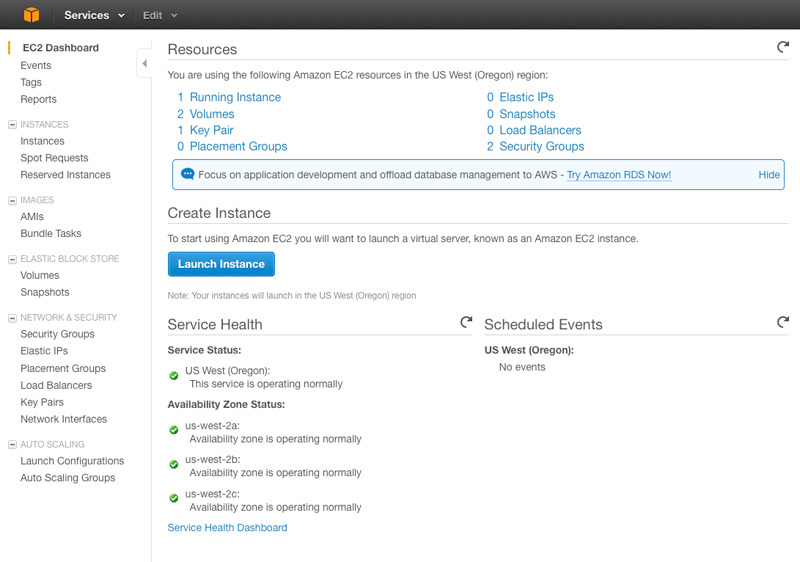 One of the big benefits of EC2 is that a lot of the heavy lifting is being done for you, behind the scenes. Here you see that I have launched an instance called geckobrothers, and it already is configured with an external IP to connect to. That connection brings up another similarity with Open Stack. You’ll see in the next slide that I have created a keypair for the geckobrothers instance. As with Open Stack, you use that keypair as your means to log in to the instance. Volumes are handled in much the same way. You can create volumes, on a variety of Amazon services, and attach them to, or detach them from, instances on the fly. Here you can see that I have created a 16 GB volume and attached it to the geckobrothers instance as /dev/sdf. There are a host of security tools built in. By default, the server is only accessible through the AWS console. To enable access from outside, you build rules into the firewall protecting the instance. The geckobrothers instance has been built as a LAMP server. You can see that it is now accepting http and https traffic from anywhere (0.0.0.0/0), but only allowing SSH connections from two specific IP addresses (my home and work computers). Another similarity with Open Stack, the basic networking setup. 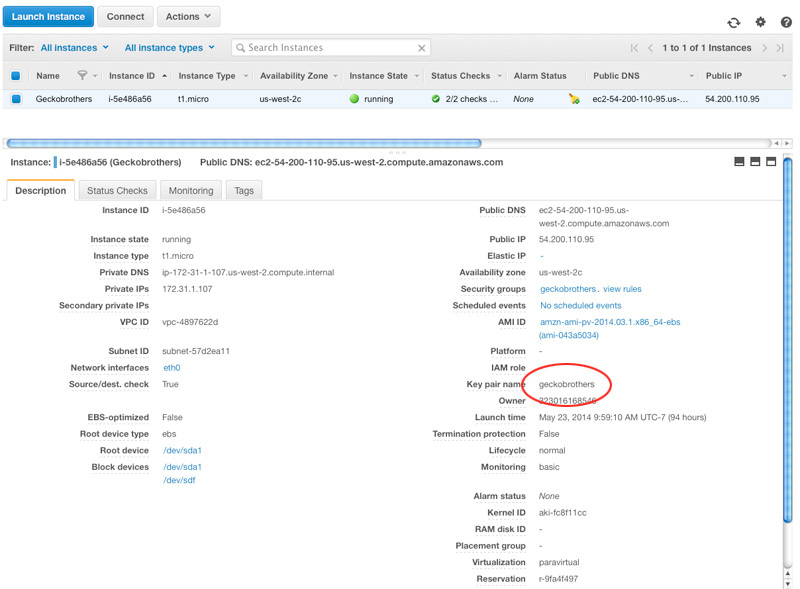 Here you can see that the instance has an internal IP address for AWS communications, and an external for connecting from outside the AWS system. 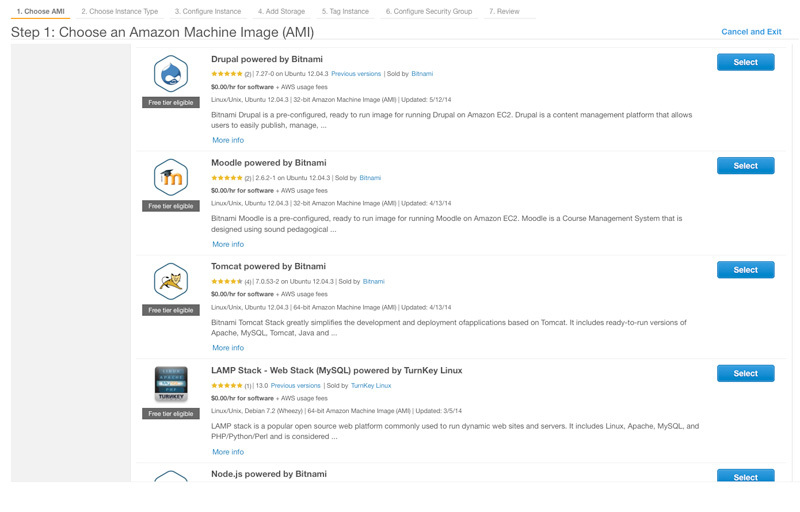 One of the big bonuses in using AWS is that you have a huge number of public images to choose from, as opposed to creating your own collection of images with an Open Stack system. Here is a look at one page of the public images available. As you can see, as of this screenshot, there were over 13,000 images to chooose from. 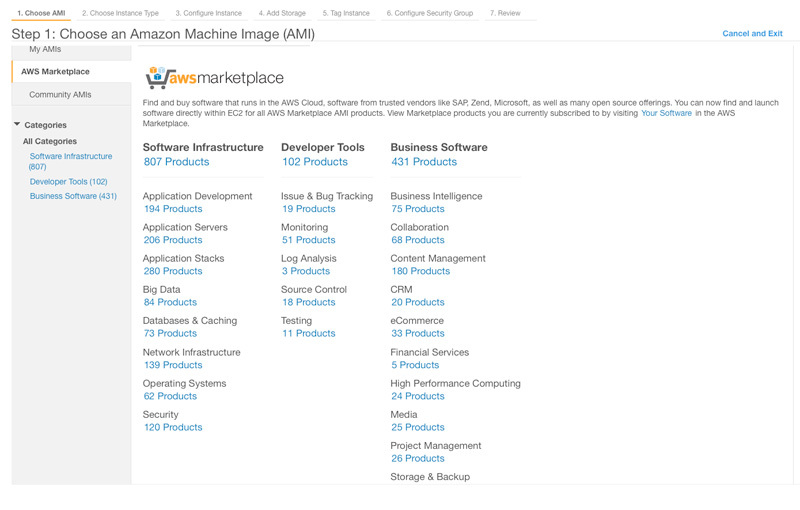 That advantage is carried one step further with the AWS Marketplace. Here, you can get systems pre-configured with specific software packages. Of particular note, these are not just systems provided by Amazon. 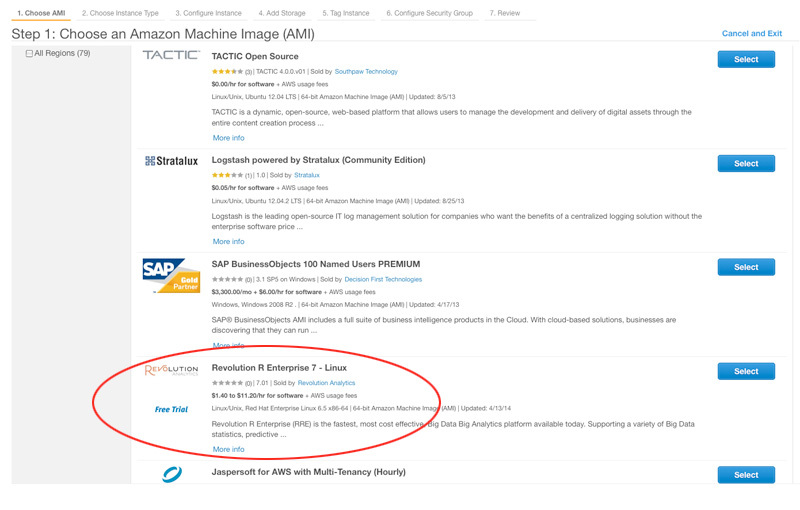 As you can see in this next capture, Revolution R Enterprise 7 (statistics programming) is being sold through the Amazon Marketplace by Revolution Analytics. Pricing varies. The Revolution system is priced anywhere from $1.40 to $11.20/hr + AWS usage fees, while others are free to use Open Source packages, as seen in the next capture. The range of software is already impressive, with Operating System choices that include CentOS, Debian, Ubuntu, Amazon Linux, FreeBSD, Red Hat, Cloud Linux, Octane Cloud, ORBX, SUSE, and Windows (2003, 2008, 2012). You can even get a pre-configured Oracle server. 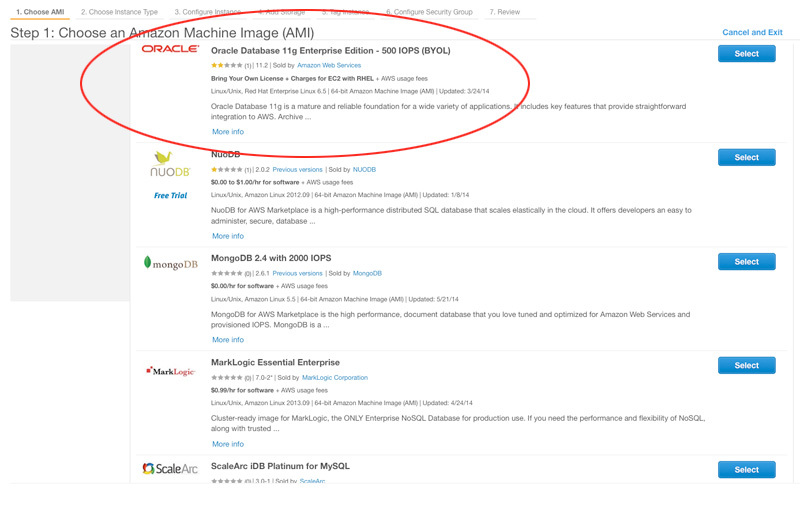 This also adds another pricing option as you’ll see the Oracle image is listed as ‘Bring Your Own License’. The ever-growing marketplace, and the luxury of having all of the hardware managed by Amazon, combine to create the huge advantage the system has over a self managed Open Stack installation. At the end of the day, both systems are capable of doing the same things. Anything you can do with AWS, you can do with an Open Stack installation. The rub is that the Open Stack ‘day’ will be a very long one. Customers will need to weigh the time/cost of building and maintaining the Open Stack system against the cost of the AWS package.